Want Healthy, Sustainable, Delicious Seafood? Try Mussels! | It's not your tech, it's how you use it. I’m very quickly learning that mussels are a delicious treat that more people don’t know about or haven’t tried, so I’m out this week to change that. Not only are they easy and quick to cook, they’re utterly delicious when simmered in a white wine and garlic butter broth (like shown here) or in a tomato sauce. They’re great to eat, they’re good for you, and they’re sustainable and easy on the environment. What’s that? It sounds too good to be true? It’s not, I promise: which is why you should enjoy them now, before we do something silly like start overfishing them or their population crashes. The only real catch is that you might have a hard time finding really good ones: after all, most chain grocery stores aren’t about to have live, fresh Moncler outlet bivalves in their cold case, no matter how delicious they are. So what do you do, now that you’re interested? Well, let’s first talk about where you can get them, and then talk about why you definitely want them. The first thing you need to know is that if you like in a landlocked area with no short route to water, you’re probably boned here. 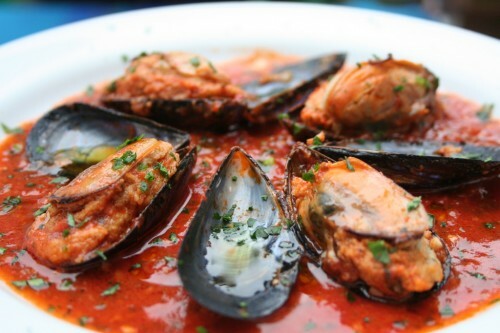 Seriously – unless you’re willing to pay the exorbitant amount of money required to get live mussels from a lake or coast to your local restaurant in, Nebraska – hypothetically, then your odds of finding good mussels are pretty slim. Even then, if you do find them, I would suggest first that you question their freshness before you buy them or order them, okay? I’m not saying you can’t get them – I am saying that you’re going to have trouble getting good ones, at least affordably. Now then, with that aside, if you do have access to a waterfront, marina, or a decent seafood market, those are probably your best bets to find them. Good seafood markets or a solid fishmonger will likely have a good stock of live mussels, either locally caught/farmed or shipped in along a major route from somewhere on your coast where they are caught or farmed. Your next stop if you’re really looking should be a gourmet grocery store – doesn’t have to be a small one, but it does have to be a grocery store you know is uppity enough to carry something like mussels. You know where I’m going here: skip the Walmart grocery section and head over to your local Wegman’s. Once you’re in a position to buy some, make sure they’re good and alive before you pick them up. If they’re in a bag, tap the shell of one of them to see how many of them close up in response to the vibration. If they all do, you’re in good shape and they’re all still alive. If a bunch of them are tightly closed when you get to them, that’s a good sign. If a lot of them are wide open or don’t respond to the tapping, they’re probably dead and you should skip them. They should also smell briny, or like the sea – not at all fishy. You know the adage about seafood: if it smells like fish, it’s not for eating. Once you get them home, get them out of the plastic, rinse them a little, and put them in a bowl with a damp cloth over it and put them in the fridge until you’re ready to serve. I’ll be the first one to tell you that if you’ve purchased some fresh mussels, try to eat them the same day: that’s when they’re best. So now what do you do? You cook them, of course! There are Moncler outlet several ways and tons of different delicious mussel recipes, but when you’re cooking, pay attention to the whole open/closed thing: If you take them out of the fridge and any are wide open, toss them. If you cook them and some of them are closed up tight, they’re no good. If you want some great recipes for fresh mussels, try this Mussels in White Wine and Garlic-Butter Sauce from PioneerWoman (where the image above is also from,) or this recipe for Mussels in a Cilantro Cream Sauce from eHow, which also gives you a handy guide to picking and storing Mussels if you want one thing to print out and stick to the fridge. For too long relegated to “mixed-seafood pasta” jumbles or clichÃ©d steams with white wine and herbs, it’s time for mussels to get shown a little love. They can seem intimidating for home cooks, but really, I can’t think of anything easier to prepare. And I love how sitting there with a big pot of them, slurping them out of the shell, soaking up the broth with bread, turns dinner into an event of conversation and juice-slicked hands. Great. Now I want mussels. Oh my god, I love mussels. I can't eat them anymore, which makes me deeply sad. Perhaps one day.